· Thromboembolism is clotting within the venous circulation and is different than bruising or hematoma formation in which the blood clots outside of the blood vessels. · Thromboembolism can lead to vein damage, which sometimes results in chronic leg swelling, discoloration, and skin fragility. · Thromboembolism can be dangerous if large fragments of the clots circulate to the lungs where they can block blood flow to the lungs. When doctors talk about blood clots, they are referring to a condition called venous thromboembolism (VTE). In VTE, clots have formed within the veins, the vessels that return blood from the extremities and other tissue to the heart and lungs. A bruise or hematoma is quite different. Bruising is commonly caused by a blow to the leg and many other forms of injury resulting in bleeding into the tissue from damaged and torn blood vessels. While this blood does eventually clot in the tissue, it is no longer in the circulation within the veins and is not dangerous like VTE is. 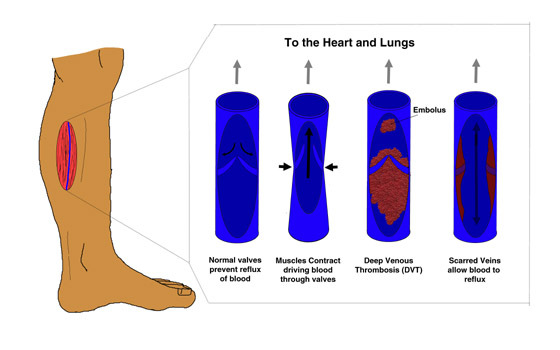 The most common type of VTE is deep venous thrombosis (DVT). DVT is when the blood gels within the vein usually totally occluding it. If this happens, there may be no visible sign or symptom and often no pain. There are so many veins that if one gets blocked often there will be still enough to drain the venous blood from the tissue. 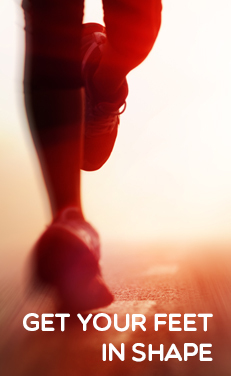 If the vein is large and important enough it can cause the leg to swell or hurt. The clotting can be self-perpetuating because the platelets, the small cells within the blood that controls clotting, release proteins that encourage more blood to clot. The clot can begin in a small segment of vein and extend up the vein. The larger the segment of vein affected the more likely it is that the problem will become serious, even life-threatening. The clotted veins that are involved in the DVT sometimes do re-canalize or redevelop a center through which blood can flow. However, this vessel is not normal because the vessel wall is damaged. Along the vessel wall are valves, flaps that encourage the blood to flow toward the heart. The clots damage the valves. When the valves become damaged, the pressure within the veins increases. As a consequence, the blood pools into stretched out veins. These veins become the dilated varicose veins. The increased pressure causes small bleeds that stain the skin a brown color. This is called venous stasis dermatitis. Venous stasis dermatitis makes the skin very fragile and when it is injured, the swelling inhibits healing severely. Also, as a result of the increased pressure against the vein walls, more fluid flows out of the vein walls into the tissue causing swelling. The most dangerous consequence of DVT is pulmonary embolus (PE). This happens when a blood clot breaks away and floats down the vein to the lung where it gets caught in the circulation there. This keeps the blood from getting to the oxygen within the lungs. If it is large enough can actually keep blood from getting to one or both lobes of the lungs. Shortness of breath or death can quickly result. The clot usually needs to be from a fairly large vein in order to have a significant effect on the lungs. Figure.Illustration of Vein Function. In normal circumstances, the valves prevent blood from flowing backward toward the feet, decreasing pressure within the veins. The normal contraction of the muscles pushes the blood through the veins. Clots within the veins attach to vessel walls. Some can break away and float toward the lungs. After organization of the clot, a opening can reform within the vessel, however, the valves no longer function properly leading to varicose veins. This increase in the pressure causes the legs to swell and the vessels to bleed more frequently.